For over 50 years Abey has been synonymous with quality and innovation, bringing the latest designs and technology to Australia. With over 1,200 products, the range is a result of consistent and on-going product development. 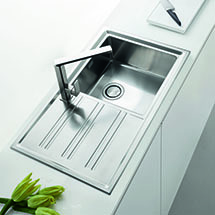 Abey offers the largest range of kitchen and basin taps and sinks in Australia, as well as exclusive collections such as Barazza. Abey prides itself on offering a collection that is committed to the environment as well as one that maintains top-tier design to compliment any budget.